In the first of four debates between the eight candidates looking to become the next president of Iran, the format seemed to at least partially confirm critics’ cries about the debates being a farce. First, each candidate was asked to explain policy plans for specific areas, such as the economy and unemployment. In the second round, a series of short questions were asked—during which no direct interaction between the candidates was allowed—and the moderator asked candidates to respond with one word. “I’m patient, but where is this going? 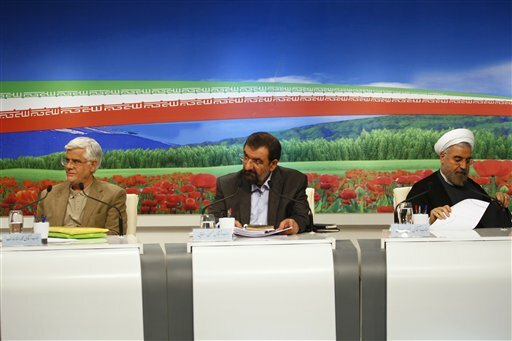 We have to debate each other,” said Mohsen Rezaei, after charging that state-run television shouldn’t have formed the questions. The pictures included an agricultural field with tractors, buildings with banners, and a mine in Utah. The more than three-hourlong debate shows the intense interest of who will be the next president, while illustrating the tension between the candidates and the ruling government. Some candidates continue to push for elections more independent from the ruling government about two weeks before the June 14 election. Several days ago, for instance, a spokesman for Aref said state television cut off one of his campaign broadcasts unexpectedly, citing technical problems. The control of the election process has also brought heavy criticism from some who say the elections are far from fair. Former President Ali Akbar Hashemi Rafsanjani, seen as the best hope for the Green Movement, was not allowed into the race by Iran’s Guardian Council, which recently whittled the field down from more than 800 candidates. There are others who see hope in the election for some kind of reform, the extent of which is uncertain. Lord Maginnis says that “farce or otherwise, the coming elections are of primary importance to the future of Iran, of the region and of the world.” While the elections appear to still be tightly controlled, the resistance both outside and within the country continues to gain momentum, he says. In the next three debates, cultural issues and domestic and foreign policy will be the focus. In the earlier and less controlled part of the first debate, there were some issues discussed during the first and less controlled part of the debate, which are highly relevant for Iranians, such as the economy and unemployment. Iran’s inflation rose from 25.4 percent on average during the past Iranian calender year to 38.7 percent in the first month of this year (March 21 through April 20), according to the Statistics Center of Iran, reported Mehr News. Unemployed persons numbered almost 3 million through March of this year. Unemployment, at 14 percent overall, affects some parts of the population more than others. “66 percent of women between the ages of 20 – 29 [are] facing unemployment,” said Hasan Rowhani, former nuclear negotiator and reform candidate. To combat inflation and unemployment, Ali Akbar Velayati, a former foreign minister said there should be an emphasis on production, and aid put forth to farmers. Aref, meanwhile, said the country needs to attract investors, and attract more tourism. Another crucial topic came up when the moderator asked the candidates about the reduction in Iran’s oil revenues, and how candidates are planning to deal with it?